I went back into my archives from last month and our trip to Colorado. I haven’t had time to get out with the camera much. Hopefully that will change soon. Here is a building storm over the Rocky Mountains. Love, love, love all the layers and those dramatic clouds. Fantastic image!! Love it and would not mind at all having that on my wall. Nice high dynamic range shot. Really brings out the detail! 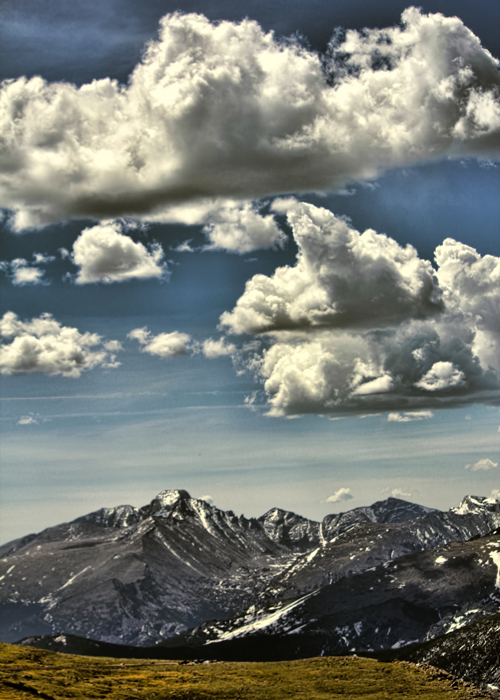 Rocky Clouds over Rocky Mountains. When In the “Rocky” Mountains could you hear him calling for “AIDRIAN – AIDRIAN”? Just wondering? Those clouds are so beautiful. I had forgotten how beautiful the skies were in the park. Wonderful photo. Awesome shot! I can almost hear the thunder. Have a great day! I hope these oh so dramatic clouds gave up some rain in the right place. What a knockout shot! Now, this is merely wonderful! love the way you have interpreted this theme – great shot!